I haven’t posted in the last few days, as I was running around. But, I wanted to make sure I post at least this one tonight. After a few hectic days in Austin, I ended up in Boston on what is termed as the coldest ever in the last 90+ years. (In US, there will always be some statistics to quote...). After a few years back in Chennai, this was a punishment. 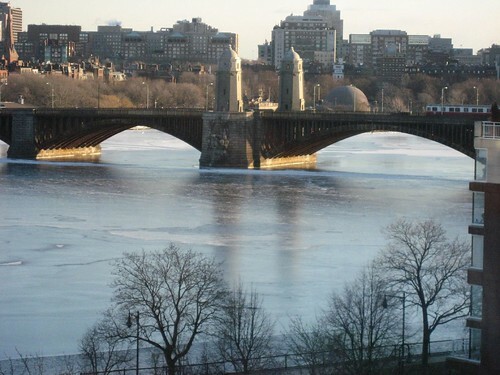 Frozen Charles River, which separates Boston from Cambridge. This river and its surroundings are generally a beehive of activity during summer days. To make matters worse, I landed in Boston Logan Airport well past midnight and was already tired. I had to make a hasty retreat to the warm confines of the baggage claim area no sooner I stepped out to look for the Rental car area. I simply froze all over and couldn’t handle the artic blast. Nevertheless, I had to step out and find the bus take me to the rental car area and head to the hotel. It wasn't a pleasant experience in the wee hours of the night. Renting a car for a short stay in Boston downtown area was a mistake. Not only did the weather make it difficult to driver around and look for the address, the parking situation made things really worse. I had to shell out USD 30 per day for parking just in my hotel !!! On the positive side, some portion of the multi year, multi billion big dig project is over and it is now easy to get in and out of the airport. Check the weather and dress accordingly. It is OK to the over do than be left trembling in the middle of the night. Use Taxi / public transport for short trips to Boston downtown area. 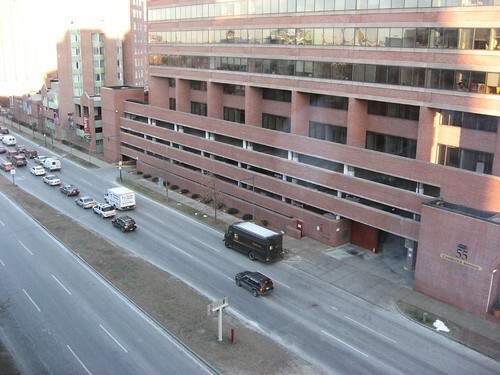 Stiff parking rates make renting a car unattractive, particularly if you are staying in the Boston / Cambridge downtown area. You travelled to U.S keeping your favorite weather in your pocket and unleashed that wherever you went. Even when you did not carry weather protecting garments, you did weather through those and accomplish what you set out. Good luck in your next jouney to another continent this week after North America. But this year's winter has been brutal both to health and to the pocket. I paid $250 for 1 month's heating bill in December. January is much worse and I dread it. This has been the longest trip yet for me.. I am on the third leg my trip, in Columbus now.. and two more to go.. Toronto & Beijing.. will be glad when I get home on 2/9.. I wish.. it was coffee, jolly stuff.. but far from it. !!!! Jokes apart, Boston was really tough for me.. I am dreading that weather in Toronto.. I have the same question as Karthik, how on earth do you get to travel so much? Hmm.. depending on how you look at it.. it the 'upside / downside' of this 'new' flat world we live in and global nature of the IT business..